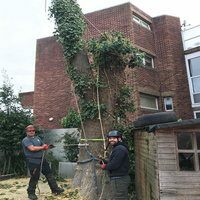 This very large Tree of Heaven, growing in Chiswick, West London, had to be removed as it was too close to the neighbouring buildings and properties. It is always sad day for us tree loving folk to remove such a large tree, but often there is no other choice. 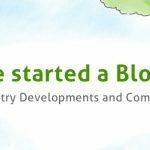 See our blog on Tree Planting and Choice for more information on this topic. This species of tree is native to the rain forests of India and is notorious for very brittle timber and shedding of large limbs. It grows very quickly, with a mature size often too large for most London gardens. It prolifically self-seeds as well with hundreds of saplings arisings from a parent tree. In certain areas they can be classed as an invasive species and are typically classed as high maintenance trees often requiring intervention from a tree surgeon on a regular basis in order to keep them maintained and suitable for their location. Especially in built up urban areas! Given the location and size of the tree, this was a particularly challenging and demanding operation which took our qualified and experienced team two days to complete. Advanced aerial tree rigging techniques were required in order to ensure a safe, controlled dismantling process to minimise disruption to the surrounding areas. See our Tree Removal page for more information. This involved the use of specialist rigging ropes attached to the sections being removed, secured to the tree using slings, carabiners and friction saving pulleys. The cut sections were safely and smoothly lowered to the ground by the groundsman using a friction management device known as a bollard. Once safely on the floor, the cut sections were processed and loaded onto our trucks to be carted off site. One of the requirements of the job was to remove the stump and extensive surface root system. For this job we opted for the use of a large, hydraulically operated stump grinder to ensure we ground down to the required depth so that the area could be put to better use in the future. This also helped in significantly lowering vibration levels felt by the machine operator, compared to smaller manually operated machines and greatly improved the efficiency of the task. 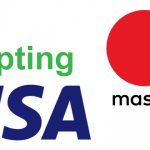 We’re very pleased to announce that we can now take payment by credit or debit card over the phone as an alternative to a bank transfer or cheque. You’ll see the Mastercard and Visa logos on our website – when you receive your invoice you can now choose to call Jane in the office and she will be happy to take a payment over the phone. Your privacy and security is very important to us so we guarantee that your card details will not be stored, and there is no additional charge for paying by card. We’ll still take payment by bank transfer or by cheque from those that prefer these methods but we hope that giving our clients more choice will make the process easier for all involved. One of the first and most valuable bits of information I came upon when starting in the industry was to Plant the Right Tree in the Right Place and at the Right Time. This has stayed with me and is now more apparent than ever. So much of what we do as arborists is managing trees that were planted without the realisation of how big they would eventually become. Or the impact they would have on their surroundings, especially when planted close to built structures or in a small London back garden where space and light are vitally Important. With proper thought and planning, the correct species or variety of tree could make all the difference between something that is admired and appreciated by all to a tree that causes repeated issues and eventually suffers the axe or is pruned to harshly. Certain species respond better to crown reductions and pruning works than others, so with some thought it is entirely possible to have larger trees in our landscapes that still contribute to the amenity of the area and still look like trees, rather than the ‘hat-stands’ we often see around London. The large variety of trees available to us really do give plenty of options to select the correct tree for the location and to tick the boxes of what is required. If you are after evergreen foliage, Magnolia grandiflora ‘Little Gem’ is a great example of a smaller variety of a normally much larger tree and grows to about 25-30ft in the landscape. A fantastic native tree is Crataegus monogyna ‘Alba Plena’ with stunning double white flowers and an eventual height of around 20ft. Pleached trees are all the fashion at the moment as they take up very little space and can offer instant screening due to their well trained and narrow profiles. Species such as Hornbeams or Beech are well suited to this and native as well. The time of year is crucially important to give new plantings the best start. Often a tree planted in the mid-summer can experience scorch or drought stress and this can really have an impact on the trees health and eventual lifespan. The ideal planting season in the UK is November to March. But with careful thought, species selection and site preparation this can be extended. If you are looking to do some planting works in your garden or have any projects you would like to discuss with us, please give us a call on 020 7183 5611. 2018 is going to be a big year at Tom Boswell Tree Services and we are going to tell you all about it. Charles, Sarah and Tom will keep you updated with all our Company news, industry developments and also some lighter aspects of our job. We had some big changes in 2017, new features to our website, more teams, better systems and procedures, new vehicles and renewed focus on our existing clients’ and their needs coupled with plans to expand the business yet further. Visit our new Career page if you wish to find out information on how you can become part of our team.